Based in Mt. 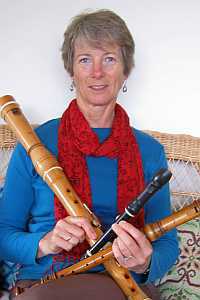 Victoria in the Blue Mountains NSW, Catherine Weaver is a recorder teacher and performer. She holds a Bachelor of Music from the Sydney Conservatorium of Music and a Diploma of Teacher Education and is an experienced classroom teacher at infant and primary level. Catherine has toured for Musica Viva in regional areas, performed in overseas concerts, recorded for radio stations ABC-FM and 2MBS-FM and ABC Television and is a former president of The Early Music Association of NSW. She teaches recorder to all ages, with a particular passion for working with children.